The interior of this liquor store builds on an industrial theme with abundant daylighting and warehouse style fixtures. 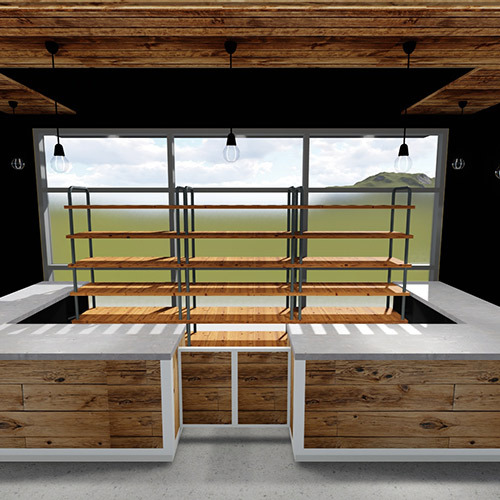 This 4,200-square foot liquor store in newly constructed shopping complex offers 2,200 square feet of retail space and showcases neutral tones, utilitarian objects, and wood, metal, and concrete surfaces. The result is a modern industrial feel that invites browsing and provides an engaging shopping experience. The space is well lit with a combination of pendant lighting, LED suspended light fixtures, fluorescent linear fixtures and wall mounted sconces. Natural light permeates the glass storefront which is frosted at the pedestrian level with vision glass above. 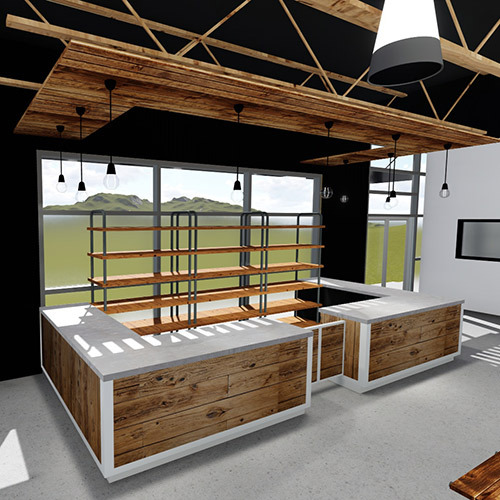 A tasting counter and the checkout counters impart an industrial feel through the use of stainless steel/concrete waterfall style countertops placed atop storage shelving fronted with horizontal wood panels. Free standing displays draw the patron’s attention to hanging signage and a suspended wood canopy over a tasting counter located on the eastern wall of the retail area. 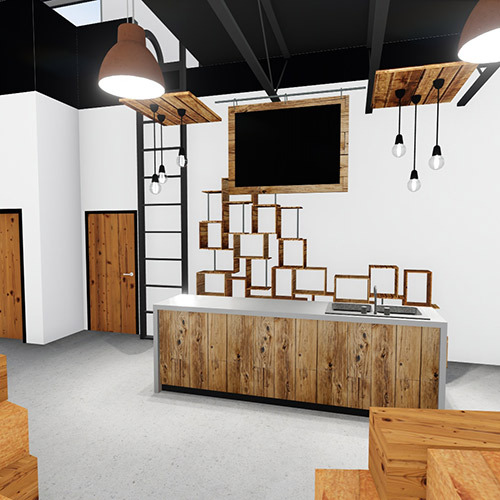 Behind the tasting counter a stacked wall display consists of stained plywood shadow boxes and iron pipe and flange. 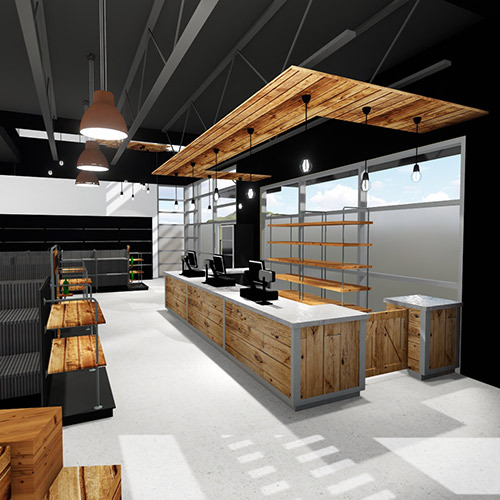 Wood and metal elements are juxtaposed with the liquid filled glass bottles throughout the store. 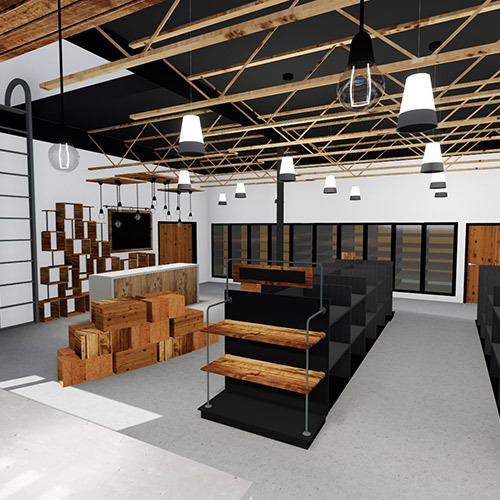 Wooden display shelving supported by iron pipes are reminiscent of a distillery and showcase spirits and liqueurs while wooden display crates showcase local wines and invite customers to explore the available varieties.